Abbott Northwestern nurse and MNA spokesperson Angela Becchetti calls on Allina to respond to nurses’ proposals to improve their safety on the job. When Celeste Kopacek’s patient in the neuroscience unit at Abbott Northwestern Hospital told her he was going home to get his gun and would come back to find her, she reported the threat to Allina security. “They told me to call back if he showed up,” Kopacek said. Since contract negotiations with Allina began in February, nurses at five metro-area Allina facilities have made several proposals aimed at improving their safety on the job. Erinn Olson (L) and Celeste Kopacek display a partial list of the attacks Kopacek has suffered while working as an Abbott nurse. 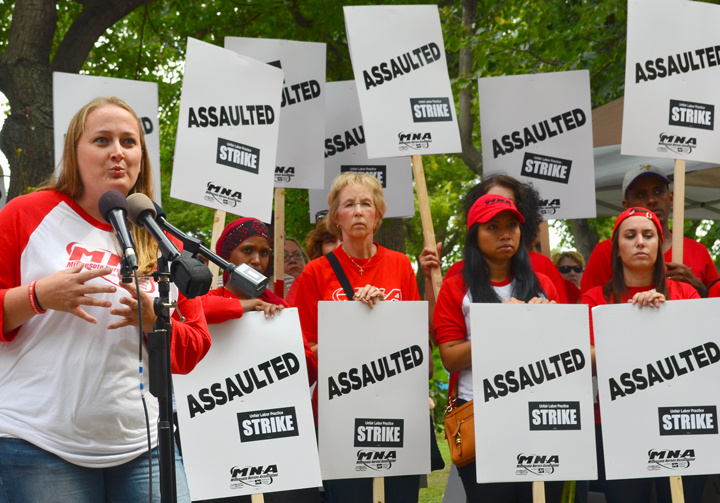 Allina has refused to respond to those proposals, nurses said at press conference today outside Abbott Northwestern. Instead, the not-for-profit corporation has focused almost exclusively on slashing nurses’ health insurance. Nurses want a heightened security presence in their facilities to reduce response times when patients become violent or dangerous. Nurses have seen an uptick in such incidents over the last 10 years, in part, because of untreated mental illness, opioid addiction and other substance-abuse issues. 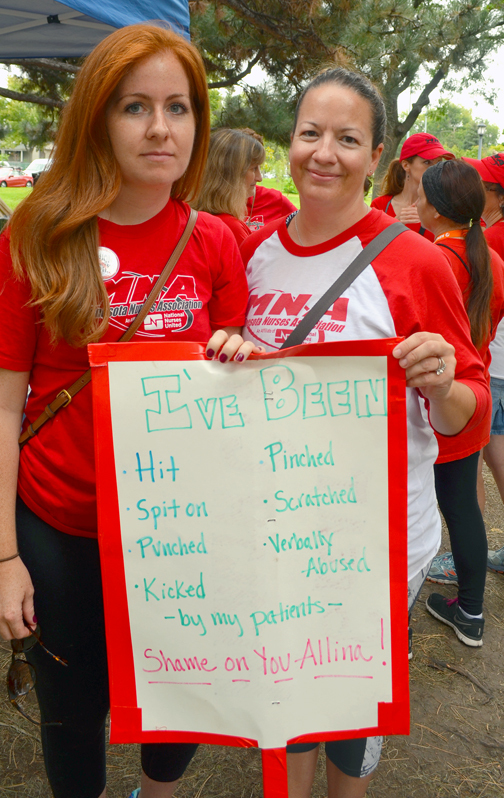 Nurses also want Allina to provide counseling and paid time off to nurses who are victims of violent incidents, as well as more training in how to diffuse them before they begin. “We need more than two hours of training,” said Erinn Olson, Kopacek’s colleague in the Abbott neuroscience unit. About 4,700 Allina nurses are on strike at Abbott Northwestern, United, Unity and Mercy hospitals, as well as Phillips Eye Institute.